Jeff Sessions and Dave Brat right before Sessions’s appearance at a fundraiser for Brat in September 2014. False! Brat has had intimate ties with Sessions and the Breitbart crowd from early in 2014 and is therefore well placed to have knowledge of Sessions’s complicity in Russiagate (see below and Act One (especially) of a recent This American Life episode). Brat’s Breitbart statement is months ahead of any inkling in the national press that Sessions had met with Russian Ambassador Kislyak or had recruited Carter Page for Trump’s foreign policy team (see here for details). Brat appears to have known enough to suspect trouble was brewing and wanted to seem less in Sessions’s debt than he in fact is: Brat owes his 2014 victory in no small part to Sessions’s efforts. To wit: Stephen Miller, then Jeff Sessions’s chief strategist (now Trump’s chief policy adviser), consulted on Brat’s 2014 primary campaign. During his time with Sessions, Miller was in daily contact with Breitbart’s Julia Hahn, who became Brat’s press secretary in early 2015. All this is documented in Julia Ioffe’s excellent Politico article. 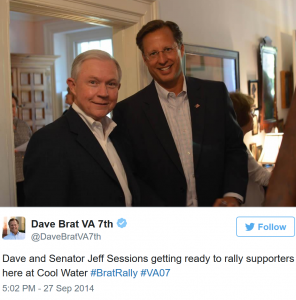 And Sessions was a main attraction at a major fundraiser for Brat in September 2014 where he compared Brat to Patrick Henry (!!) Now, how on earth could Brat have forgotten THAT? Brat’s ties with Trump & Klan may have got frayed recently over the health care debate, but when the Russiagate conspiracy was going down in 2016, they were still strong and binding. Indeed, as is evident from the linked documentation above, it was Brat’s victory over Cantor that showed Bannon et al how an anti-immigration message could win them the presidency. Brat was their shining knight. I have documented HERE and HERE the support Brat received from Steve Bannon and Dave Bossie (president of Citizens United until he joined Trump’s campaign) in 2014. Since then, I’ve discovered other connections, such as heavy donations from five members of Betsy DeVos’s billionaire family, beginning in 2014, but ramping up in 2016. Is it mere co-incidence that Brat was the lead on a January 2017 letter supporting DeVos’s Cabinet nomination? DeVos’s mother, brother, and father-in-law (along with Bannon, Bossie, and Kellyanne Conway) have been members of the secretive and arch-conservative Council for National Policy (see the SPLC’s exposé of the CNP, with a link to its 2014 Membership Directory). DeVos’s mother, Elsa Prince Broekhuizen, founded Focus on the Family; her brother, Erik Prince, founded Blackwater, has ties with Steve Bannon, and and is under FBI scrutiny for setting up a secret meeting in the Seychelles to establish a Trump-Putin back channel. So, Dave, totally understand that you want to create as much space as you can between yourself and Sessions, who you know is implicated in a possibly treasonous scandal. You can’t run away from your friendship with him since your arrival in DC: you co-authored a memo on immigration with him and you went on a GOTV “Drain the Swamp” tour with him in a last-ditch effort to put Virginia in Trump’s column (hah!). But you can try to limit how many know the degree to which your success depends people who are willing to wheel and deal away our democracy. Funnily enough, “brat” is Russian for “brother,” and I’ll bet you know a thing or two about what Brother Jeff has been up to, and maybe some of his comrades, too. I hope those investigating Russiagate will get up in your grill about it real soon – because you ain’t no Patrick Henry.